The VT Castlebay UK Equity fund is an Open Ended Investment Company (OEIC). The company invests, for the long term, in the equity of UK companies. It can also invest a maximum of 20% in other assets such as cash, fixed interest securities or overseas equities. 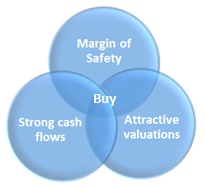 Companies with a valuation Margin of Safety, trading at a discount to their own history. Companies with an operational Margin of Safety, whose business models create a Moat, protecting their operational returns from competitors. Companies that generate strong cash flows - to pay us the investor whilst we wait. Companies whose intrinsic value increases daily so that even if the market votes against them in the short term, they continue to grow in value. Companies whose returns on the capital they employ are well in excess of the costs of that capital. Companies whose returns are mainly driven from returns on sales and assets and not leverage. Adherence to our criteria means there is a restricted universe from which to invest and the number of companies in our fund will be between 20-30. This is a sufficient number to provide adequate diversification whilst ensuring that only our best ideas are invested in the fund. We invest in companies for the long term and do not speculate on short term price movements. This normally results in low turnover which also reduces the cost of managing the fund. The managers have capped the cost of each share class and include all fund costs except stamp duty and broker commission.